Do you need to fill the stage with bubbles in as little as several seconds? 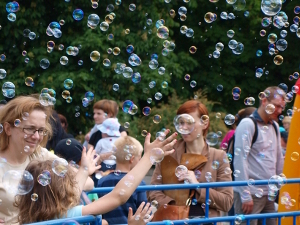 Or maybe you want soap bubbles flying over the entire area during an outdoor event. We have highly efficient machines for creating clouds of soap bubbles. The number and parameters of the machines are selected so as to avoid slippery floors and to make sure the final effect is consistent with the client’s vision. We use only top-quality certified German liquids which do not stain clothes and are completely safe for children participating in the events.